Written by Paul Wager, photographs by Michael Whitestone. Published in Retro Cars, issue 42, December 2006, Future Publishing Ltd, Bath. "We don't do modern," laughs Dougal Cawley, appearing from behind a chain-driven GN Frazer Nash, drive chain in hand. And wandering round his vast stocks of classic rubber bears out this philosophy as half-forgotten names peer out at you from the sidewalls: Aquajet…, Denovo... SP Sport..., XZX..., even TRX. If it's black and round - and fits something old - then the guys at Longstone Classic Tyres will probably be able to tell you what it came off, probably blindfolded with one arm tied behind their back. The racks in the firm's Bawtry premises contain everything from knobbly dawn-of-motoring crossplies, through '70s performance radials, right up to the esoteric modern classic stuff like the massive rear boots for '90s Ferraris. They've tried most of them, too - often in big, smokey circles in the yard next door - so they know what works. So how do you get into the world of retro tyres? Well, a motorsport background helps and in Dougal's case the vintage racing bug was already in his blood, thanks to his father and uncle both being enthusiastic VSCC stalwarts. After a chequered career -which kicked off as a YTS butcher and ended up as marquee erector, fisherman and tree surgeon via spells in France and Australia - working for Longstone was a natural progression for Dougal, who had already started in vintage motorsport and was showing the early signs of a truly terrifying Cortina habit. Some eight years later, Dougal bought out the original proprietor and the business is going strong. Meanwhile, he proudly admits to having personally scrapped "around 20 Cortlnas." 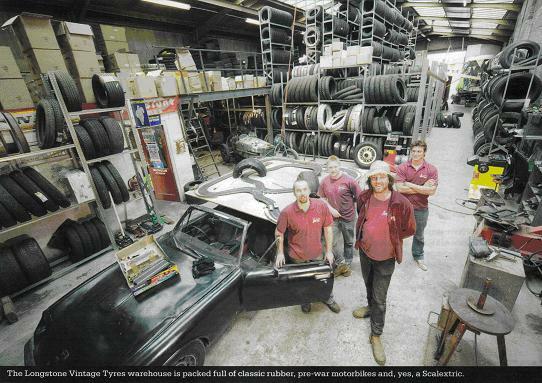 Aided by colleagues Liz, Tom, Simon, James and Michael, Dougal aims to supply the tyres you just won't find at the fast-fit depots - and such is their passion for the subject that they'd rather send you away empty-handed than flog you a pair of unsuitable tyres for your classic. This is illustrated perfectly by the choice for XK Jaguars: the first tyre to come hurtling down from the racks is the original-spec crossply - nice, comfortable but not exactly a performance tyre. The cheap-and-easy replacement is a 15 inch radial and a set of new wheels to suit, but it comes with drawbacks: the tread area is wider than the crossply so the steering will be heavier. It's ugly too and back in the '50s, tyres just didn't tend to have the word 'classic' moulded into the sidewall. The tyre Longstone will steer you towards is one you won't be offered at a fast-fit depot: the Michelin X, which is a near-perfect diameter, offers the right tread width and looks spot-on too. If that sounds too easy there's also the Michelin Pilot X, which is a higher-performance version of the same tyre, offering all the benefits of Michelin's modern Pilot tyre range. Broach the subject of fitting modern tyres to retro cars and you sense you've tapped a nerve with the Longstone guys, who are at pains to point out that retro suspensions are designed to work with retro tyres and that slapping on the stickiest set of low-profiles you can find is often the wrong thing to do. Yes, a set of modern tyres will increase the ultimate limits of grip, but when it snaps it'll snap horribly quickly and you'll be through a hedge before you know it. Stick to suitable tyres and you'll still have a nice progressive set-up that gives you plenty of warning before it bites you. The subject takes us right back to the era of the crossply tyre. The crossply is generally what's known as a 100 per cent profile - in other words, the tread is about as wide as the sidewall is tall. That tall sidewall is more easily distorted and doesn't offer the same rigidity as a radial tyre, but it does offer a huge amount of feel for the driver. In something like a '50s Jaguar, you need all the feel you can get when you're cracking on a bit, but as car chassis have improved and the driver's involvement has diminished, this 'feel' has become less important, and power steering lets you carry wider tyres too. An understanding of all this is why Longstone can generally point you towards a tyre that will improve your retro car's handling, without the potential pitfalls. After all, what you want from your retro car is to be able to have fun at the speeds you can reach on today's roads and narrower tyres mean more roundabout action. Of course, if you're the concours type you'll have to run the gauntlet of abuse from Dougal and his colleagues (and from us too) but they'll still be able to supply original-spec tyres for you. With our CX Turbo experiences still fresh in our mind, we asked Dougal about metric tyres, expecting to unleash a storm of controversy. We weren't disappointed either: Retro Cars writer Everett's rather too blunt observation that TRX tyres were universally rubbish really stirred up a hornet's nest of opinion. Crucial to the argument over metric tyres is Dougal's first question: "But have you ever tried a car on a brand new set of TRXs?" The answer is invariably no: most people only ever encounter a 20-year-old set of shiny, age-hardened TRX tyres on a cheapy eBay motor and immediately set about replacing them with standard equivalents. As a new tyre though, the TRX is still well regarded by those in the know, and in its day it was good enough for most Ferraris, Formula One and Group B rally cars, as well as run-of-the-mill Metros, Jags and BMW's. Cast your mind back to our Not Invented Here piece in the July issue and you'll remember that there's a lot more to the TRX tyre than simply being sold in millimetre diameters: the whole concept was based around a special wheel rim that allowed less deformation of the tyre's sidewall, in turn allowing a more comfortable ride with a shallower profile. The idea really worked too and Michelin is still making the TRX today as part of its Michelin Classic Tyre operation. Yes, they're expensive but the bulletproof build of Michelin's tyre carcasses meant that they lasted well. Sometimes too well: Dougal reckons he's had customers see 40,000 miles from a set of metric Michelins and when you're in the tyre business that's not really what you want to hear. Despite that, Dougal's a firm advocate of fitting new TRXs on a car that originally came with them, reckoning you won't find a better tyre to suit the car. Although, there's still that nagging feeling that somehow it's good to see the French fail at something. In fact, Michelin, Dunlop and Avon all get praise from Dougal for their classic tyre operations. Avon is especially well regarded for its crossplies, which are apparently the ones to fit. And Dougal reckons that if wasn't for Dunlop's efforts, many pre-war cars would have been scrapped long ago. The Longstone van is a familiar sight at classic and vintage race meetings throughout the season, but the majority of their business is by mail order. A big stack of tyres leaves every afternoon and in most cases they'll be with you the next day. One of their hobbies is leaning on their courier firm to squeeze the carriage costs down so it's always worth asking for free delivery. If you're in the Doncaster area you might even persuade them to fit the tyres for you, and if you're running wire wheels then it's definitely worth a visit to get them balanced properly. As Dougal explains, with large-diameter wire wheels the best way to balance them is statically using a spirit-level device that seats the wheel correctly on its machined mounting taper. Try to balance wire wheels in a modern, dynamic machine and it just won't work. If your wire wheels aren't true then Longstone can also put you in touch with an expert skilled in the black art of straightening spoked rims. "Never mess with the spokes," is the advice from a man who's seen more than his fair share of inexpertly adjusted wire wheels collapsing at VSCC events. Not that the march of technology has bypassed the world of classic tyres though: one of Longstone's hottest new tyres is the Michelin TB15, a road-legal 'slick" that's so good it's won every championship in which it's allowed. Essentially, it's a slick tyre with a band of tread running down the centre. The TB15 gets around the 'two-thirds of the width' tread rules by declaring only the centre to be the tread. The rest is, ahem, sidewall... officer. The TB range was originally designed for competition cars in the '70s and '80s, and has been revived by Michelin to cover the gap in the market for competition tyres in 13 inch and 15 inch sizes. With an updated compound for improved grip and an original tread pattern that makes the tyres 'feel' right on a modem classic, the TB comes with all the 'E' markings to make it road legal. The sizes range from 175/60x13 up to 335/35x15 so it covers everything from Renault 5 Alpine to Lancia Stratos. When they're not talking tyres, there's plenty in the warehouse to keep them busy: in one corner is a collection of pre-war motorbikes, next to a 1921 Bean, while a Scalextric rests on the tail of a Jensen-Healey. Next to the office is Dougal's 'Piglet' - a GN Frazer Nash running a Ford Model A engine and campaigned to good effect in VSCC events. The chain-driven beast is good for 130 mph. And drifting round the Scanias in the lorry yard outside, as he's only too happy to prove for our cameras. Outside we find Dougal's everyday car: a 1928 Model A Ford, complete with stuffed fox cable-tied to the radiator. Despite the lack of a roof, Dougal still drives the thing 10 miles to work all year round, presumably keeping the Zetec-powered Cortina for weekends. Running on a pair of Webers, the 16-valve Cortina transplant is pretty simple and the result is a blast, as we discovered when Dougal lent us the keys. Only the lack of a limited-slip diff stopped us competing in the car park burnout stakes. When the rest of the family turned up in another Model A Ford and we discovered that the family car was a Daimler V8 (we're talking Mkll Jag era here, not the new Ford parts bin effort), we understood what Dougal meant by "not doing modern". If fast-fit tyre depots are your idea of hell, and you just don't want a set of Korean low-rider alloys with 30-profile rubber on your retro motor, then give Longstone a call and they'll sort you out.